More than two decades ago, the last lion in the Central African nation of Gabon died. Now, one intrepid cat has found a new home there. 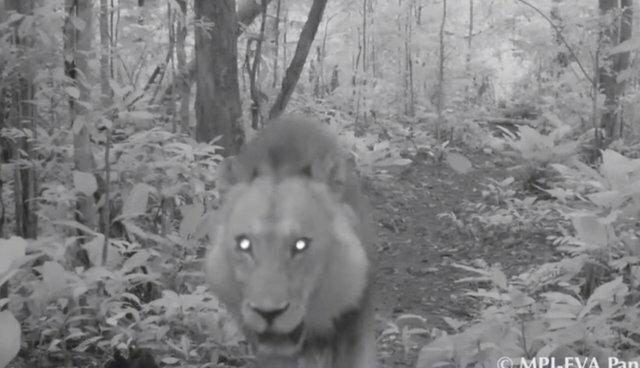 For the first time in 20 years, a male lion was filmed strolling through the country's forest. The animal had likely walked over 150 miles from the coast of the Democratic Republic of Congo to reach Gabon. He was caught on film by a camera trap that scientists use to study chimpanzees. Lions were declared "locally extinct" in Gabon in 2002 due to extremely high levels of poaching. One researcher who observed the recent tape was flabbergasted to see the lion so far afield from home. "I basically couldn't believe it," Phil Henschel, Ph.D., who has surveyed lions in Gabon for the conservation organization Panthera, told CNN. "Not only did we think the lion was extinct in the region, but when I first surveyed in 2001, there was such intense poaching that it was inconceivable that a lion could exist in the area." While this lion's return to Gabon is gives hope that the cats could someday return to the country in earnest, the battle isn't over for African lions. Due to poaching and hunting for their meat and parts, combined with crippling habitat loss, lions have faced sharp declines; they've lost half their numbers since the early 1950s. Now, fewer than 21,000 African lions remain on the entire continent.